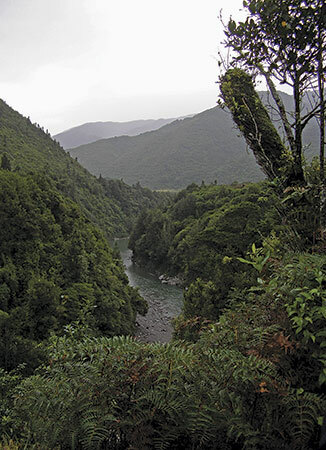 View of Otaki River from terrace at Otaki Forks. Council is looking at whether the bank at the site of recurring slips on Ōtaki Gorge Road needs to be re-stabilised. A slip a fortnight ago about 3km from the Tararua Forest Park at Blue Bluff, saw around 400 cubic metres of debris block the road, causing it to close for nearly two days. Council’s Roading Network Performance Team Leader Neil Williams said the bank has a lot of unstable fragmented rock material on it and overnight rain caused it to slip onto the road. ‘Benching’ the bank around 10 years ago stabilised it effectively until the extreme flooding in June. “We understand this has been inconvenient for residents who have been cut off and we will assess the site to see if further work is needed,” says Mr Williams.